Corsica - the birthplace of Napoleon - is a Mediterranean island with a culture owing as much to Italy as to France. But Corsicans, who have long had a difficult relationship with France, consider themselves unique. The result is a distinctive culture on a rugged, wild island. The magnificent coastline has fine beaches and some of the most varied landscapes in Europe. The climate is benign and the island is not spoiled by tourism. The hike follows the coastal path through Mediterranean flora. In spring rose colored cistus flowers and the white blaze of Asphodels cover the hills. The warm sun on the maquis brings forth the invigorating smell of wild myrtle, thyme and rosemary. There are wonderful views across the sea and towards the mountains. 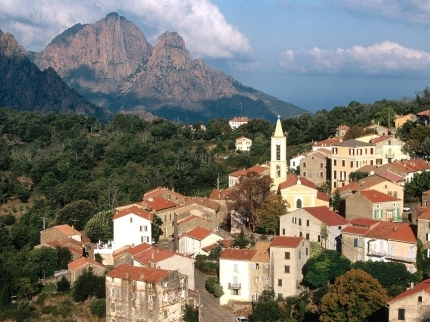 Walk to Corsica's highest village and take a picturesque train ride. The best part of this trip is the wonderful scenery highlighting the contrast between the coastline and the mountain regions. There are many good local wines and meals as well as countless magnificent views.